Made of 3/4″ pine (most scrap material) this eight panel window screen is held together with seven sets of hinges. Approximately 18″ high, panels can be added or taken away depending on the width of your window. Works well as a fireplace screen also. The exterior images of the homes are Gina’s handiwork. No patterns, just her creative thoughts. 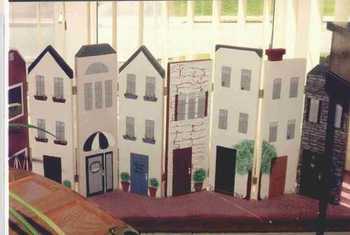 She wanted it to resemble the style of row houses typically found in larger cities. She did a great job!